New to bioconductor & DESeq2. 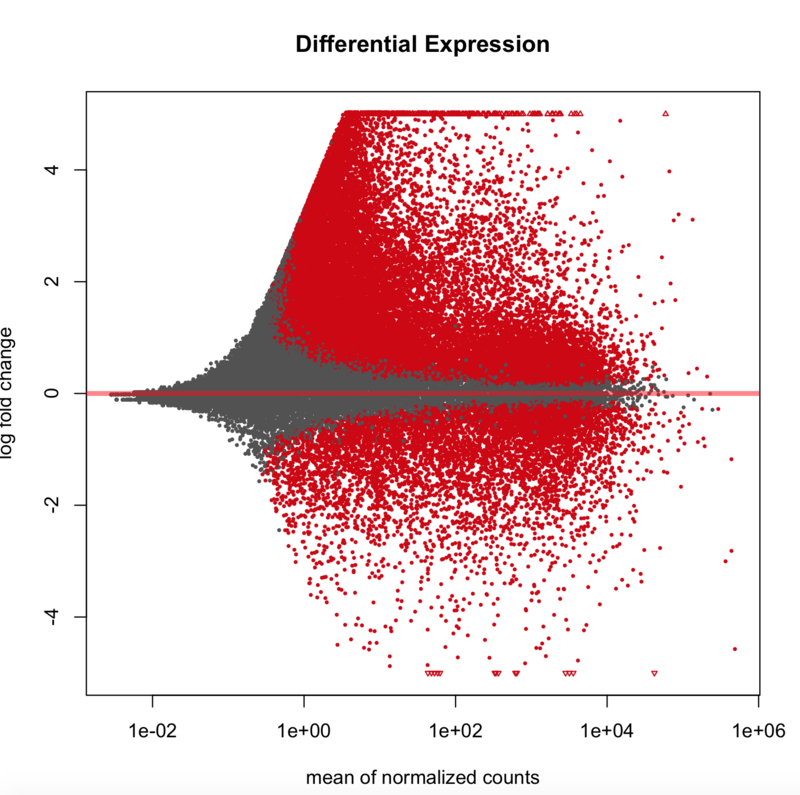 I have trying to look into the differential expression of primary tumor vs matched normal tumors. My question is that once I run the analysis & print a MA-plot I seem to have way to many differentially expressed genes. Is there any command of function that I may be missing in my analysis? You may be interested in the lfcThreshold argument of results (take a look at ?results and at the DESeq2 paper). I noticed you aren’t including the matching information in the design. This would look like ~patient + condition. You said you had tumor normal matched samples, so it sounded like there would be a covariate that identified the patient/donor. No covariate. Would I need one for proper analysis? I only have one type of factor in my colData object. The patient identifiers which are my row names & the condition: if they are MPT (matched primary) or NT (normal). Is there anymore information I need to provide? I have recommended already to use ~patient + condition. This involves adding another factor patient to colData(dds). This is discussed in the DESeq2 vignette, that you can add additional covariates to account for this variation, while your final results table will focus on the condition differences. If this is confusing what the design means when you use ~patient + condition, I'd strongly recommend to discuss this model with a local statistician at your institute. My analysis also goes from taking ~15 mins to about 3 hours. The rows not converging is not always a problem. Rather than changing maxit you can use the following filter, where n is a minimal number of samples, for example 5 samples having a count of 10 or more. Thank you. I am running this code as of now. Should I continue to use the nbinomWaldTest function. Or would the general deseq2() function work best? You can use this code. The message just says that local is substituted if you read it. Thank you for your help. Is there any reasoning for choosing to only keep rows with at least 10 counts total & in 5 or more samples? Is there any other literature I can read to support these numbers or are they more at the discretion or the person funning the analysis. Error: unexpected input in "dds$condition <- relevel(dds$condition, ref=‚"
Everything is up to your discretion as the analyst.